Workplaces and alcohol have a long and tipsy history together, from 60s-era Mad Men culture to a co-working space hot-button topic today. It’s no secret that the tech industry is pretty drink-friendly, with a beer fridge often nestled between the ping-pong table and a snack bar on the list of attractive workplace perks. But, in recent years, we’ve started side-eyeing tech’s drinking habits. 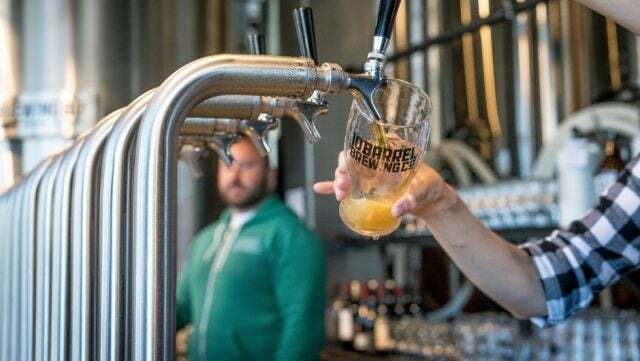 The #MeToo movement has impacted drinking policies at major companies – most prominently, WeWork dropped its unlimited beer tap option last October following sexual assault allegations at WeWork events. Now, a new study has pulled tech drinking culture back into the spotlight. The tech world, the study found, is the single industry most likely to allow or sponsor alcohol consumption in the workplace. Specifically, a little over half (53%) of the tech industry was found by the study to include alcohol at the team bonding events. A further 35% of tech firms offer company-sponsored happy hours. Moreover, about half (49%) of the employees across all industries (not just tech) thought that drinking with a coworker or their boss would improve their relationship. However, moderation is still in order – most said that two drinks was the right amount. Over-indulgence is an issue likely to crop up at any drinking event. However, it’s an expected downside, rather than an existential threat to the concept of workplace drinking itself. A larger issue is the cultural pressure on those who won’t drink at all. 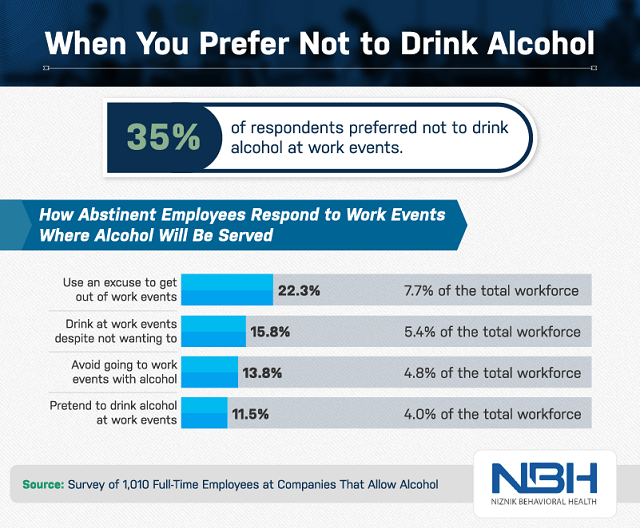 Of the 35% of respondents who prefer not to drink at a work event, 22.3% said they would give an excuse just to avoid the work event entirely. That was the most common response, followed by drinking anyway (15.8%). A remarkable 11.5% of respondents said they would pretend to drink at such an event. In other words, even moderate workplace drinking can have a concerning effect on the one thing it’s supposed to encourage: employee bonding. Needless to say, you don’t want a full third of your workplace to feel uncomfortable at your party. If you’re committed to drinking, make sure that alcohol-free options are easily available and try to fight any stigma or pressure as best you can. Some recommend including an equal amount of non-alcoholic to alcoholic drinks at every tech event (and advertising as much beforehand). This actually might be easier than you think. Plenty of alcohol producers have been adding an increasing amount of non-alcoholic options over the past few years. Are Dry Events the Answer? Dropping the alcohol at a workplace event isn’t likely to upset too many people, with almost a third of the survey’s respondents saying that they’d even prefer a healthy alternative such as massages or exercise. Dry events may not quite replace drinking ones in the tech industry. But, there’s a sliding scale for how inappropriate workplace drinking can be. Sponsored happy hours may feel fine, but team bonding exercises will make abstaining team members a little more uncomfortable if non-alcoholic beverages aren’t included. Drinking at after-work events can feel better than bringing beers directly into the nine-to-five itself, but the pressure to conform to a tech work culture can remain. The bottom line: moderation is a must. And the tech industry’s status as the number one top drinking industry indicates that it might need a tad more moderation yet. The post Study Finds Tech is Number One Industry for Workplace Drinking appeared first on TechCo.